Data Center Infrastructure Management (DCIM) software is quickly becoming the core engine of data center operations. Be clear on problems you want solve. Don’t get caught in the feature comparison trap. Understand current processes and desired outcome. Partner with peers in other functions and gain alignment. Ensure there is a team identified to own and maintain the system. Start small and expand over time. Expect integration - make sure the platform is open. Partner with a trusted, reliable and experienced vendor. Take advantage of expert services. Ensure people are trained and regularly monitor usage. 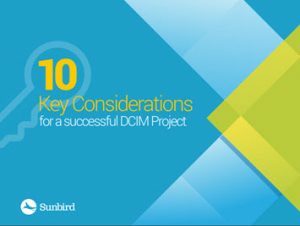 Download the new DCIM project tip ebook from Sunbird Software for a primer on implementing DCIM software.